The challenge seemed so interesting in the beginning...then as I studied on what...oh, what...would I do, I became quite flummoxed. It became an un-welcomed assignment for me. I avoid introspection. Self-revelations are not sought. 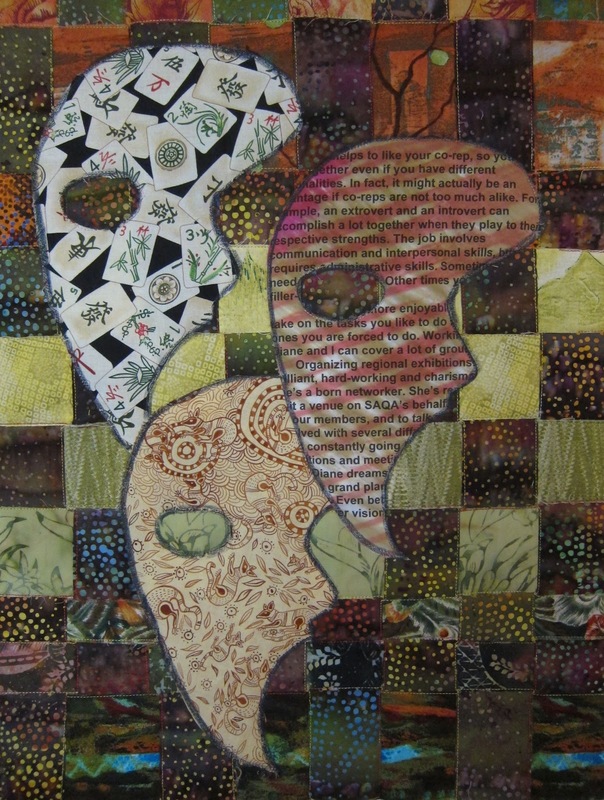 Then, the Studio Art Quilters Association's newest edition of it's journal was released. Thumbing through...looking at the pictures first, of course...otherwise it's just words, words, words...when I was surprised to see an article written by our Kate Themel. Had to read that first. Her article is about the skills and requirements needed to be a SAQA co-rep. I was stunned (!) to read her descriptions of me. No one had ever, ever described me as charismatic or an extrovert or much of her other adjectives. There, indeed, was a mask. I wear many masks. Okay, one at a time...but still...there are many. I decided to limit this to three: Asian, Aboriginal and Co-Rep. The background? Well, that IS me: woven, stitched together from fabrics that all my friends would readily describe as "oh, Diane, that is so you". And for me, it gently reminds me of my checkered past. Enough of the self-revelations. This is a very successful piece, despite the kicking and screaming LOL. 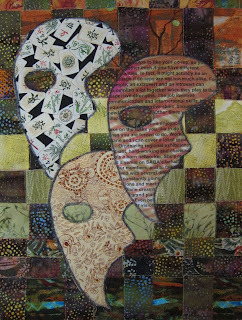 It's interesting that your masks are only partial - so that the real you must show through each one. You're right about the background; it is SO you! It must be a very effective mask/s you are wearing, because I think we all see you in the same way --- except for you! So then you ask yourself, if you wear a mask to be those things or whether we put the mask on you to make you those things. This challenge was very much like the really late night talks I had in college after a point.... Your piece, masked or not, is distinctly you, Diane.